Our 2019 Big Game Awards Banquet will be held at Alparon Park/Troy Fairgrounds on Saturday, September 28, 2019. Want to know where the largest whitetail deer, black bears and elk are taken in Pennsylvania. This is the complete official listing of all trophy big game animals taken in the Keystone State. Visit "The Outdoor Shop" on the PGC's website at www.pgc.pa.gov or call 1-888-888-3459 to order. Two black bears that once roamed the fields and mountains of Bradford County were recently accepted into Boone & Crockett's 28th Big Game Awards program. The largest of the two was taken in Ulster Township in 2011 by Jeff Fassett of Ulster. Jeff's bear scored 21-11/16 and its estimated live weight (ELW) was 638 lbs. making it the heaviest bear in our records. The previous record was a 617 lb. bruin taken by Kelly Devine in Orwell Township. Of the 763 entries in the 2013 PA Record Book, Jeff's bear ranked No. 60. by skull measurement. The second B&C entry was taken in 2011 in Asylum Township by Matt Santiago of Towanda. That skull measured 21-1/16 and its ELW was 473 lbs. 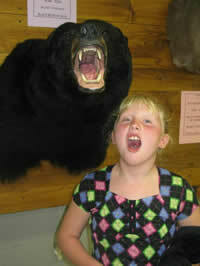 Matt's bear currently ranks 10th by skull measurement, and 21st by weight in our records, and No. 164 in the state records. These bears are awesome trophies that exceeded the 21-0/16 minimum for acceptance into B&C's all-time Records of North American Big Game. 19-0/16 is the minimum for acceptance into our Club and the PA Record Book. Our 12th Annual Big Game Awards Banquet took place on September 22, 2018 at Alparon Park/Troy Fairgrounds in Troy, PA. Bradford County's biggest and most recently harvested whitetail deer and black bears, plus shed antlers were accepted into our Big Game Records. Big Game Awards were presented to 51 individuals in 7 categories with archery hunters entering 38 of those trophy class animals. The top whitetail awards were presented to Evan Landis of Troy for Youth Typical at 137-0 taken in Canton Township; David Miller of LeRaysville for Typical Deer Gun at 154-5 taken in Orwell Township; Jeff Wiseman of Athens for Non-Typical Deer Gun at 164-2 taken in Windham Township; and Jody Schaaf of Gillett for Typical Deer Archery at 151-5 taken in South Creek Township. One of the most talked about whitetails in the 2018 awards lineup was a Franklin Township buck taken with a crossbow by Chris Radney of Canton. 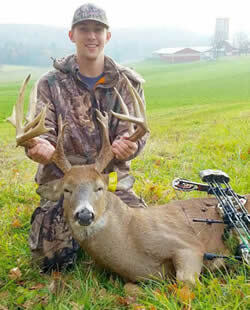 The 18 point rack grossed 195-7 with a 180-3 Non-Typical net which surpasses the previous record held by Kyle Jackson of Columbia Cross Roads by 7-3/8 inches to become the new No. 1 for the Non-Typical Archery category. 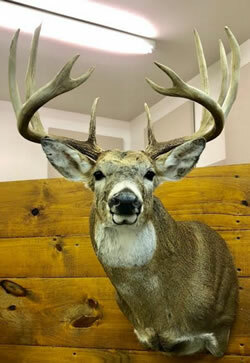 With over 17 inches of abnormal points, the Radney buck now ranks No. 26 in the PA State Record Book for that category. NOTE: Forensic aging confirmed that the Radney buck was 6-1/2 yrs. old. The top black bear awards were presented to Derek Beach of Granville Summit for a Granville Township black bear at 19-2 for Black Bear Archery; and Craig Vukov of Cedarhurst, NY for a Rome Township female black bear weighing 267 lbs. 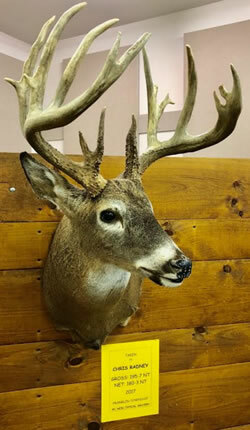 Also, the top entries in the shed antler categories added to our records were a matching set found by Gaige Williams of Granville Summit at 156-4 NT, and a massive single beam found by Doug Lantz of Monroeton at 83-2 which takes over as the new No. 1 for that category. Congratulations to all those hunters who were part of our 2018 Big Game Awards Program, and a big thank you to our Sponsors and all those who attended this celebration of Bradford County's big game hunting heritage. Henry 22 Rifle to our 2018 Youth drawing. See listing on the Sponsor Page. archery non-typical in the county. for the Non-Typical Archery category. was taken by Jeff Wiseman in 2017.